These Pet Rescue level 612 cheats and tips will help you beat level 612 of Pet Rescue. 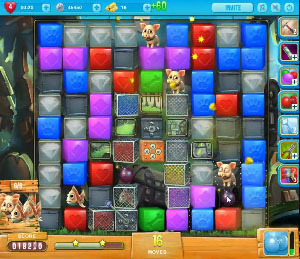 The objective of Pet Rescue level 612 is to rescue 8 pets in 50 moves and get 8,000 points. When you start out level 612, you should have a dual-goal of both bringing pets down to the bottom of the board and bringing the cage machines to the bottom of the board. The reason it is good to have cage machines on the bottom row is that the bottom row will keep the cage machines in the same row, regardless of what moves you make elsewhere on the board. This means that when a line blaster booster gets charged, you will easily be able to take out one or more cage machines in the same row. Along with cage machines, level 612 has a number of metal blocks that you must contend with as well. Given that you are saving your line blaster boosters to clear the cage machines, your best bet for clearing metal blocks is to use any bombs that you can find scattered around the board. Level 612 Cheat #3: Don’t get distracted by the blockers! Though destroying blockers is important, your goal is to save pets. Since you don’t have an endless amount of moves to use for clearing blockers, try to balance how much time you are spending on both freeing pets and clearing blockers from the board. Remember: you only need to free 8 pets to beat the level. If you notice that your goal is soon reachable, forget the blockers!